This large colourful playground is a must to visit if you haven’t been here yet. A joint project of ‘Touched by Olivia’ and Ryde Council, they have created a wonderful inclusive playground for children of all ages and abilities. 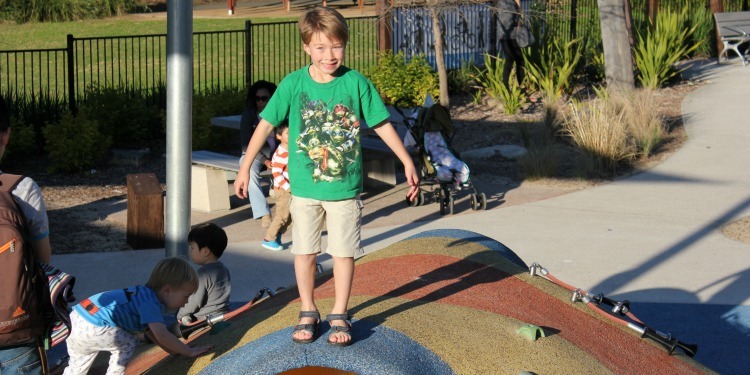 The playground has an array of play spaces to engage the kids organised into themed areas. There are two flying foxes, swings, slides built into the hill, a spinning rope pyramid, a sandpit with water play, a hammock and much more. Even on a busy day there are lots of different spaces for the kids to spread out into. There is also equipment for sensory and tactile play such as musical instruments, mirrors and other fun stuff. My kids were of course drawn to the water play and one ended up going home in just a nappy. Tip: bring spare clothes! You might also like to pack some spades and buckets for use in the sandpit. Just note that you will need to be prepared to share them with lots of other busy sandcastle builders. The playground is fully fenced with two gates for access. However, this is a playground where you will be on your feet and moving with your children if you want to be able to supervise them. Due to its large size and tiered play spaces, there is no one place where you can see the whole playground. It’s a great place to interact with your kids as there are just so many fun areas, and if you need a rest you could always get them to push you in the hammock! The playground has accessible pathways so they are pram and wheelchair friendly. The kids can bring their bikes and scooters but these are probably best suited to the paths outside the fenced playground during busy times. The playground is part of Yamble Reserve so there’s also a large grassy area to run around and kick a ball outside of the fenced area. The playground also has lots of passive areas so there is definitely space to set up your picnic rug inside the fencing, or you may be able to secure the highly sought after picnic tables and barbecue areas which are popular for family get togethers and parties. My two and six year old had an absolute ball here. We’re excited about returning soon and also visiting another of the many Livvi’s Place playgrounds around Australia. Best feature: The design caters for all ages and abilities. More Info: The park is very popular. Consider visiting early or late in the day to avoid the weekend crowds.